If your craft supplies could you an overhaul, then this ultimate guide is for you! Before you begin the process of organizing your children’s craft supplies, it’s a good idea – like with every area we organize – to begin by asking yourself some questions about the age and maturity of your children, the role you want crafts to play in your family and the space you have available for them. Can you put the craft supplies at their level, or is that a disaster waiting to happen? Do you want them to be able to get the craft supplies on their own, or only when you help them? 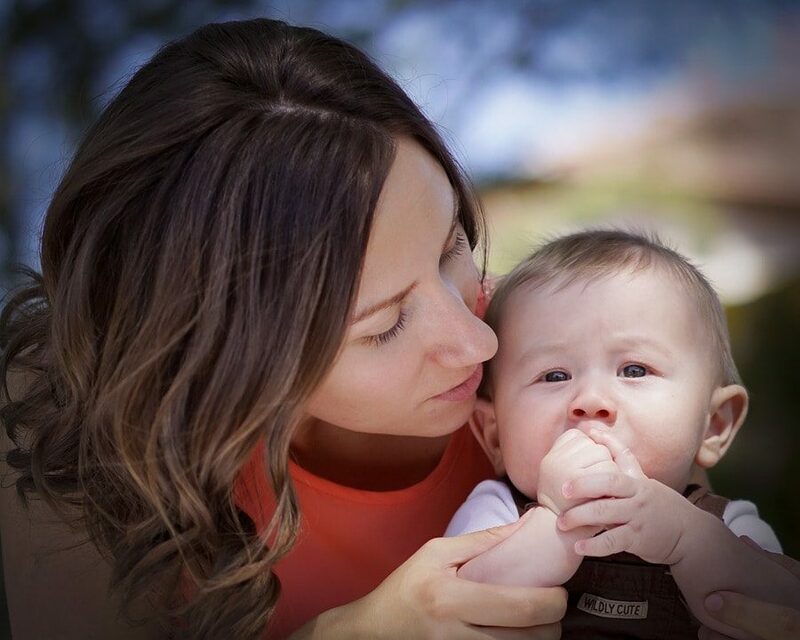 There are no right answers to these questions across the board, but there may be right answers for your family. We went through the whole “cutting hair” stage with our oldest, and you couldn’t have paid me during that time to leave scissors anywhere she might have been able to access them. Now I find that keeping some of their basic supplies where they can get to them on their own encourages more arts and crafts, which is important to me. My kids are still pretty young, though, so I don’t give them free access to everything, just the things that I think they’re old enough to handle. What role do crafts play in your family? Do you place a lot of value on arts and creativity and want your children to spend time every day coloring, drawing and creating? Are crafts something you only do every once in a while? How many craft supplies do you have? Are you happy with the amount of time you spend on arts and crafts, or is the storage and location of them a hindrace to doing it more often? Obviously your craft “philosophy” should have an impact on how you store arts and crafts. If crafts aren’t a high priority or something you want to do often with your children, then a basket, bucket or bin shoved up on a shelf somewhere may be enough. If crafts are something you want to encourage regularly, then you’ll need to make them easier to get to, so that the struggle of getting everything out doesn’t prevent you from doing more crafts. Where do you do crafts the most often? In your kitchen? In a playroom? Outside? Is there a storage space – for example, an armoire, a closet, a shelf, a drawer or a cabinet – near your craft area that you could use for storing crafts? As I said before, having the space to store your crafts conveniently will often make a big difference in your willingness to drag everything out for your children. Making more room for crafts – if they’re important to you – is a good way to encourage their use. If this is currently a problem, start brainstorming now about what areas you could shift around to make more space for arts and craft supplies, keeping in mind whether you want those to be within your children’s reach or not. Okay, now that you’ve asked yourself some questions about what role crafts play in your family and where you’d like to keep them let’s look at a plan to actually get organized. 1. Lay out all of your children’s craft supplies. I know this is always the hardest step of getting organized, but I really believe it’s the secret to getting organized By laying things out, you’ll be able to see everything at once and organize it as you pack it away, so that you can group things together rather than having them scattered throughout the craft area. Of course, if you have little kids, laying out all of your craft supplies at once with them around is a recipe for disaster when they’re around, and you’ll also need to be committed to packing it all away or dealing with the additional clutter until you get it done. 2. Throw away any craft supplies that have outlived their usefulness. This includes old glue that’s hardened, broken crayons (unless you’re really going to make these adorable melted crayons), sticker sheets that are mangled and almost empty, coloring books with hardly a blank page left in them. Sorting through and decluttering your craft supplies gives you a fresh start as you begin to organize. You’ll need less space and everything will be neater and easier to straighten. One caution: Be prepared for much wailing and gnashing of teeth if your children see their craft supplies in the trash. In my experience, it doesn’t matter how trashed the supplies are or how many beautiful supplies they still have – or that they won’t even notice if they don’t see it in the trash can – they’ll decide THAT was their favorite craft supply that they can’t possibly live without! 3. Group the crafts in a way that makes sense logically and also makes them easiest to get to. If you’re using baby wipe containers, you may put markers in one, paints in another and crayons in a third. If you’re using a larger shoe box or plastic storage bin, you may find that combining similar supplies to fill each box is a better way to do it. 4. Use smaller containers to hold small craft supplies together. Keeping small supplies contained is an important part of cutting down on the mess and chaos of disorganized craft supplies. Although there is no doubt that sorting and packing these things can be the most time consuming part of the process, having buttons or pompoms or foam pieces contained rather than just thrown in a box will definitely make it feel more organized and make the supplies easier to get to and use. 5. Pack and label your boxes! It’s okay if you don’t have a label maker, just grab some tape, write a label and stick it to the box. Once your boxes are labeled, anyone who needs access to them will be able to easily find the craft supplies. I can get basic supplies ready ahead of time so that the girls can grab them quickly and easily when they want to do craft. Although my craft storage is organized by type, these boxes or bins contain a variety of supplies so the girls can choose whichever appeals to them on a given day. We’ve cut down on the girls rummaging through bins and cabinets to get more supplies. They’re easy to clean up, and the girls can do it themselves. I can give the girls a smaller quantity of certain supplies rather than have them use all 120 pipe cleaners at one time! So how do you decide what to keep in your art boxes? You can probably guess what my answer is to that question…it depends on your kids, your family, your home and your rules! You could, of course, add whatever you want to the boxes, based on your kids’ interests, how much you want to supervise, what you have on hand, etc. I first took this picture of our “craft wall” a couple years ago, but it looks almost the exact same today, except the wall is now green and there’s a wooden shelving unit built around the washer & dryer and opposite wall. All of our stuff came from Ikea (of course!). We use the glass board for our shopping list throughout the week, notes, doodles, etc. From the bar above the board, we hang 6 plastic cups with a variety of markers, colored pencils, crayons, etc. We use the metal file holder on the far side to hold coloring books, notebooks, etc. One of the things we struggle with is how quickly we go from a good variety of craft supplies to way too much! For a while, I was offering grandparents the idea of craft supplies for birthdays and Christmas, since they’re consumable and our girls spend so much time crafting. But really, even that got out of hand, and we soon had way too much. To reduce the amount of craft supplies we have, we try to resist the urge to “get it in every color”, sticking with just what we need instead. We also share with others, plan multiple projects around the supplies we have or buy and — when all else fails — give the extras away to another family to use! A friend of mine is considering an Art in the Park day, where we can all bring our extras to share and just spend a day creating. I love that idea as a playdate for using up things that might otherwise just sit and go to waste. Another idea is to use repurposed materials — egg cartons, toilet paper rolls, shipping paper, etc. — or homemade paint, glue, etc. rather than purchasing new supplies all of the time. Repurposing is a great way to stretch your creativity, save money and avoid waste. One of the biggest challenges of arts & crafts — especially with our second daughter, who would create all day every day if we let her — is figuring out what to do with all of the artwork once it’s done. I hate to throw anything away, but we would be storing boxes and boxes of stuff if we kept it all. Display artwork for a limited time when it’s “fresh”. 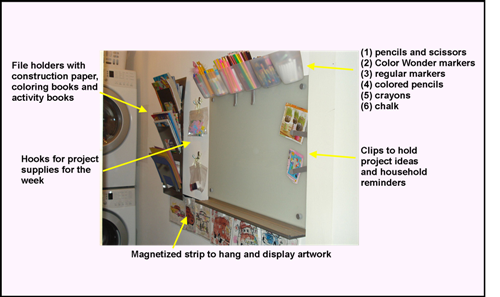 Stick it to your fridge, use a special bulletin board to display the latest projects, look for artwork frames that allow you to easily change the pictures or hang them with clothespins on a string hung across the wall. Give each child a special keepsake box for storing their most special artwork and crafts. Decide together what goes in the box, and remind them that they may have to make some hard choices if the box gets full. Take pictures or scan any pieces that you won’t be keeping so that you’ll always be able to go back and see them. 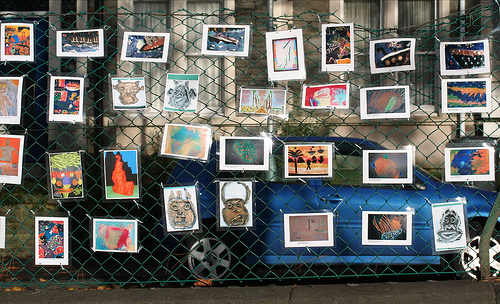 Mail artwork to a relative or friend with a special note. Use their drawings and paintings as wrapping paper or cards throughout the year. I am sure I will look back on this stage and miss the time they spend at the kitchen bar coloring, drawing and making collages, so I look for ways to contain the chaos without squelching their creativity as much as possible! 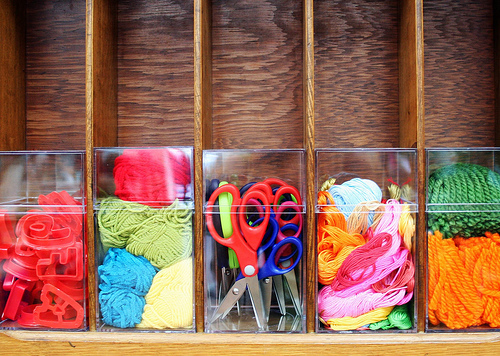 How do you organize craft supplies in your home? Question of the Day: What Blogs Do You Read?